CouponXplorer Toolbar by Mindspark Interactive Network - Boost Your PC. 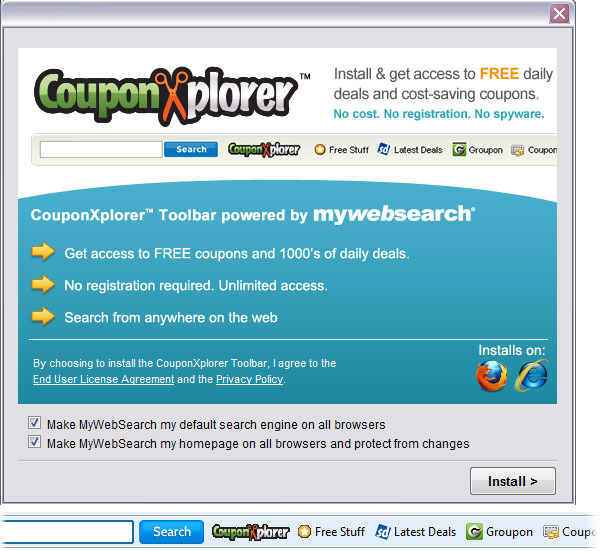 CouponXplorer Toolbar is a Mindspark Interactive Network powered toolbar (MyWebSearch) for Intenet Explorer and Firefox. The toolbar collects and stores information about your web browsing habits and sends this information to Conduit so they can suggest services or provide advertising via the toolbar. CouponXplorer Toolbar will attempt to change your home page and search provider if you are not careful during installation and provides a search box and various other generic features in the toolbar. Download Boost and enjoy your PC. Remove CouponXplorer Toolbar from your PC. Why should I uninstall CouponXplorer Toolbar? The CouponXplorer Toolbar (MyWebSearch Search Assist), like many browser plug-ins, has the potential to cause stability issues within the web browsers they load into, effecting overall PC performance. This toolbar is known to monitor your search queries and browsing habits in order to send you targeted ads and modify your search settings and results. To the right of the list item, click the Uninstall button and Boost will completely remove CouponXplorer Toolbar from your PC. Use Add/Remove Programs control panel in Windows makes to uninstall CouponXplorer Toolbar. Follow the appropriate instructions below to use this control panel. Select CouponXplorer Toolbar from the list of programs, and click Uninstall. Alternatively, right-click the program and select Uninstall. Select CouponXplorer Toolbar from the program list, and click Uninstall. Alternatively, right-click the program and select Uninstall. Select CouponXplorer Toolbar from the list of programs and click Remove. Boost helps you remove CouponXplorer Toolbar by Mindspark Interactive Network and clean your PC.